Columnist Jenny Lawson at The Bloggess.com shows us how to leverage blogs and online communities to promote a bestseller. 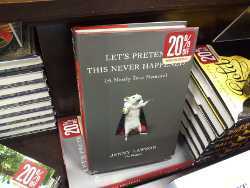 On her profile page, Lawson proclaims no one is as surprised as she to see her book Let's Pretend This Never Happened (A Mostly True Memoir) succeed so overwhelmingly, but neither she nor anyone else should be surprised in the least. Cats, cats, and more cats. Lawson never misses a chance to insert photos and stories about her feline friends (with adorable names like Ferris Mewler) as well as other information about her life into her blog. If you're not a cat person, that's OK. The important thing to remember is that writers from Michel de Montaigne to Hunter S. Thompson have provided glimpses into their personalities and passions in their work, a great way of establishing personal branding. Be sure to keep things spicy. Lawson uses plenty of...er...colorful language in her blog and proclaims the reason she launched it was the limits placed upon her in her column in the Houston Chronicle. Now, I'm not saying your posts need to be laced with profanity. What I am saying is that every blog needs a distinctive voice. Be sure to make your posts distinctive. Use chat to grow your community. Jenny holds court regularly with her community via Livestream for the Bloggess Book Club, where she shares the drink of the day, her version of a Hawaiian Slush—chambord poured over a snow cone, dishes on her life, and reads passages from her book. Needless to say, the comment section of her blog is always overcrowded with feedback from her audience. Remember, just like any blog, a bestseller needs an audience. Using one to promote the other is a great strategy to consider always.